Temporal 2x will work with most 8400gs or 9400gs Nvidia cards for 1080i. The Advanced 2x deinterlacer is thought by many to be the best, but it requires an GeForce 8600 card in the 8x series (The 8800 does not support VDPAU) or a 9600 or above. Reports on the 9500 are not available, but it is likely to work. 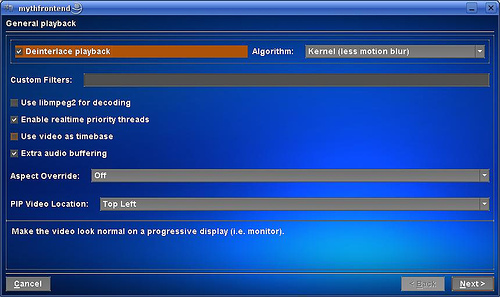 Note that for some configurations, such as the ION chipset, you may see tearing even with VDPAU enabled. This can be because there is "Composite" processing going on in parallel which is unnecessarily stealing away performance in the GPU. This can be disabled in X11.